Spring has well and truly sprung during the time I was in Yorkshire, and now it is so far advanced that it almost feels like early summer. For my part, I am looking forward to a first trip to the icecream parlour, and I very much enjoy NOT having to wear a coat. Here are a few pictures from just after my Yorkshire holiday. 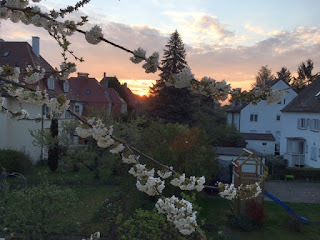 April 1st, view from my kitchen window. Notice the buds on the twig. April 15 - no buds, all blossoms! 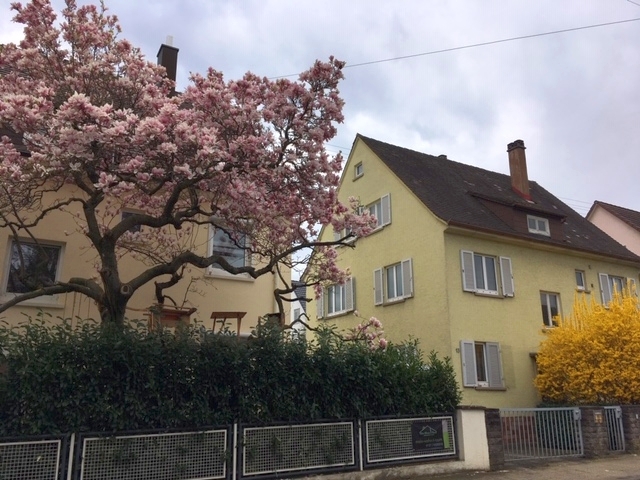 The 3rd of April, magnolia tree in my neighbourhood. It was still really cold that day. A Sunday walk in O.K. 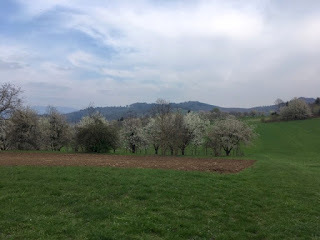 's area, with orchards just coming into bloom on April 6th. A chilly day, but spring can not be stopped. There is more to come. 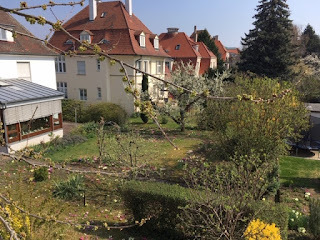 We've been to the palace grounds last weekend, and yesterday (Good Friday), my sister and I drove to my parents' allotment with our Dad - it was warm enough for wearing shorts for the first time this year, and I went on a walk and took some pictures, too. But these will have to wait for another post. When I put "Becoming" by Michelle Obama on my wishlist for Christmas last year, I already knew two things: 1. That I was going to receive it and 2. that I was going to enjoy it. On both accounts, I was not disappointed! 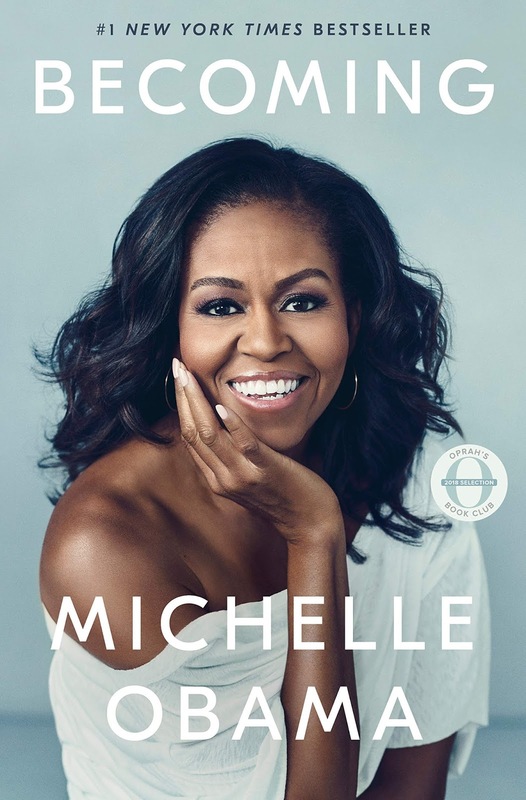 Mrs Obama manages to tell her story - for the larger part of her life, so closely interwoven with her husband's - in her own words and in a manner that should appeal to most readers. She writes very well, with a simple elegance that should be easy to understand by nearly all readers, without ever sounding condescending as if she were toning down her ductus to a simplified level. The book is neatly divided into the three main stages of her life: "Becoming Me" is about her childhood, youth and young adulthood. "Becoming Us" talks of becoming a couple with Barack Obama, marriage and founding their family. "Becoming More" tells of the wider context - the Obamas, their lives, personalities and activities closely connected to their nation as its President and First Family. The descriptions of what life was like for young "Miche", at home, at school, with her friends, and later at university, make a great read. Sometimes funny, a bit nostalgic, sometimes serious, often making the reader think. As Mrs Obama is only 4 years older than myself, I was surprisingly often able to relate to things mentioned in her book, even though we live on different continents. Her years studying and as a young professional are very interesting for someone like me who has never been to uni and much as I enjoy my job and have always liked working, has never shown such total, extreme dedication to their work. The part about the more recent past is of course especially fascinating, offering insights into life at the White House and under the constant scrutiny any public figure or celebrity is subject to, and how she has managed to remain true to herself and never forgot her values. All through the book, Mrs Obama is remarkably open and honest. I must admit that the only part of the book that, in my opinion, is a bit too open is the one about the Obamas' problems to become parents. As we all know, they have succeeded in their efforts, but I thought the descriptions of those efforts a little too detailed and not strictly necessary for understanding their struggle or the readibility of the book. She also is honest about her perception of other politicians, heads of states or VIPs she has met during the years of her husband's presidency, but she never says anything vulgar or based simply on her personal likes or dislikes about these people - in other words, she does not judge others. While I was reading, I often came across a sentence or two that would make great quotes or mottos; gems of wisdom everyone could do with in their lives. Not because Mrs Obama thinks she knows better, but because she has experienced a lot in her life and willingly shares with others what she has found to be true. This is one lady who can think and speak for herself, and she does it very well. If you get the chance, I can only recommend you to read this book. Or listen to it as an audio book, read by Mrs. Obama herself - I didn't know about it beforehand, but Monica reviewed it here on her blog not that long ago. Years ago, I read "The Audacity of Hope" by Barack Obama (click here if you want to read my review). I was interested back then in learning more about Michelle Obama, but rather disappointed with a book I have reviewed here. Now, no disappointment whatsoever with "Becoming"! On our last day, Saturday the 30th of March, we had a special event to attend: The Spring Food Home & Garden Show at the cathedral. I had read about it beforehand on the cathedral's website and penned it in my diary, and since my sister was just as interested in going as I was, we made that our good-bye treat for our last day. After breakfast, we walked to the cathedral in the morning sunshine, paid our admission fee and had a first look round. It was busy without feeling stressful, and we decided to buy our lunch there but eat it at home, on the sunny bench in front of the cottage. Also, we wanted to carry home the gifts (for our loved ones at home as well as for ourselves) we had purchased and not be weighed down by many bags. Early in the afternoon, my sister-in-law joined us, and we went back to the show with her. She, too, had a good look round, and more purchases were made. We wrapped up the afternoon by having tea and cakes in the cathedral. Later, we went to Mary's to say good-bye to her, and on the way back bought fish & chips for our last tea/dinner in Yorkshire. My room at the cottage in the early afternoon sun. Even though it is very different from my bedroom at home, it very much feels like "my" room. The next day, Sunday the 31st, my sister-in-law picked us up just after 9:00 in the morning. We had already packed and dropped off the keys with our landlady. At the station in Harrogate, we had enough time to buy something to eat for the train; it was going to be a long day. Everything went well, all trains were punctual, and our departing trip took even an hour less than arriving: 8 hours instead of 9, almost to the minute! We got off the plane in Stuttgart to a mild 20 Celsius. It was back to work the next day, so I was glad that I arrived at my flat in the early evening. It had been a wonderful holiday, with Yorkshire and our family and friends being as lovely as ever. Friday, the 29th of March, saw us once more returning to a place we love (plus it has the advantage of being easily reachable by bus): Ripley. If you want to see pictures of Ripley in the summer, simply type "Ripley" in the search box on the top left corner of this page, and you will find several posts about it from former visits. It was a day of cloudless blue sky and the warmest of our holiday so far - perfect for strolling around the beautiful parkland and village of Ripley. First, though, we stopped at the church. The official visitor season had not yet begun, and so entrance to the estate (without visiting the castle) was free. It is one of those places that are beautiful in all seasons and weather, but of course we were extra lucky today with the sunshine showing the parkland and gardens at their best. We don't know what the point of this huge chair was, but I could not resist sitting on it. It was lunch time, and the café just across the road from the castle (also part of Ripley estate) was busy. We still managed to find a table outside in the sun and ordered lunch. My Yorkshire Platter was huge - my sister had to help me, even though her own meal, a quiche, wasn't exactly tiny, either. It was delicious, and sitting out there in the sun made the rather long wait for our food and drinks easier. Afterwards, we walked around the village (which is quickly done - it really isn't much more than two rows of houses along the main road) and then up the hill, past the estate and through beautiful woodland, filled with spring birdsong, before it was time to go back and catch a bus home to Ripon. The day ended with a visit next door, at our landlady's, who served us delicious nibbles to go with the G&T all three of us opted for. Thursday, the 28th of March, was much friendlier weather-wise than the Wednesday had been. We even had coffee/tea on the sunny bench in front of our cottage! But before that, there was another highlight of our holiday: a lunchtime concert in the cathedral. The pianist was a sprightly elderly lady from York University (or York Music College or something like that - I'd have to look it up to be more precise, sorry), and her theme was Bach. Not only did she play a selection of popular and less well-known pieces by the great composer, she also surrounded them with pieces by later composers who were influenced by Bach's work. She explained a bit about what she was going to play, and it wasn't dry facts - her explanations really enhanced the experience. There were also sandwiches and drinks to be had in the church before the concert statrted, and the general atmosphere was very friendly. We made use of the beautiful sunshine by going for another walk in the afternoon, along another river - this time, the Ure. It was a path we had not yet walked before, and we enjoyed the variety of woodland and fields along the river banks, with the sights and sounds of spring all around. Leper Chapel (left). Someone was cleaning there, so we did not go inside this time. Later, I popped in at Mary's for a chat, before it was time to head back to our cottage, where my sister was making a delicious risotto for our tea/dinner. On my way, once again the cathedral front was bathed in the most beautiful evening light - I could not resist taking yet another picture of it.